Thanks so very much. I really appreciate the quick assistance. I received the package with the beautiful comb yesterday morning. Thanks again! It’s perfect! They are so beautiful. Sincerely — Sherry D.
I’m starting with what is possibly my favorite of the photos- above is the Lillian Grace Brooch pinned on the lightly beaded neckline of a dress. Take a look at those pear crystal petals by Swarovski! I wouldn’t always suggest a pairing a brooch with beading but I love this. 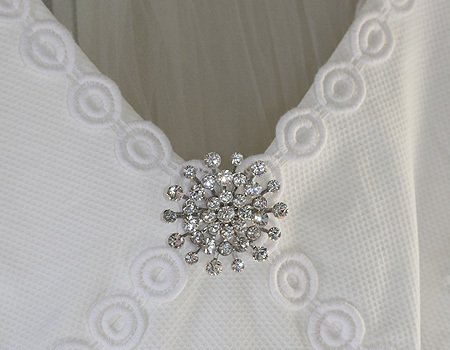 It’s delicate and feminine and the silver toned beading reference the silver of the brooch. I made the Garden Party Brooch several years ago for my sister-in-law. For her I made it with light topaz crystal which we pinned on a champagne colored silk band which finished the strapless neck line of her beautiful dress. This brooch design became an instant favorite and one I love to suggest placing of the waist of a gown, shown here, as well. It dresses up last seasons knee length strapless beach dress from J.Crew very nicely. 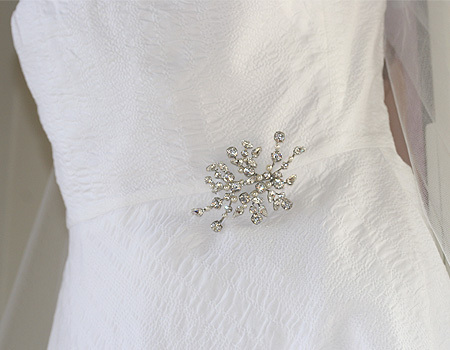 Here the Lillian Grace Brooch is pinned on the waist. I love the graceful swoop of the leafy design. It’s as perfect pinned in this direction on the waist as it was one the above pictured neck line. LOVE! Lastly is the center placed Lola Brooch on this deep v-neck dress again by J.Crew (yep, it’s a favorite)! I love how the circular brooch emulates the embroidered circles on the dress. Sadly, the only time I wore this dress I hadn’t yet designed Lola. This is actually a post for another day, but combining 2 Lolas on the hip of a gown is gorgeous and a very popular way to order and wear this design! 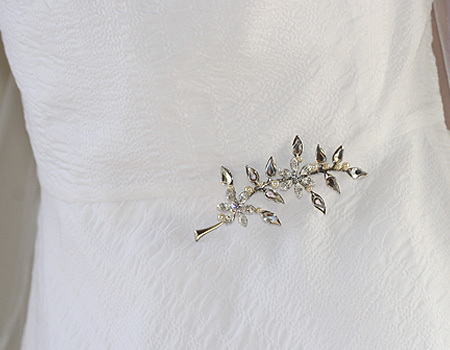 Tell me: Are you planning on wearing a brooch on your wedding day? 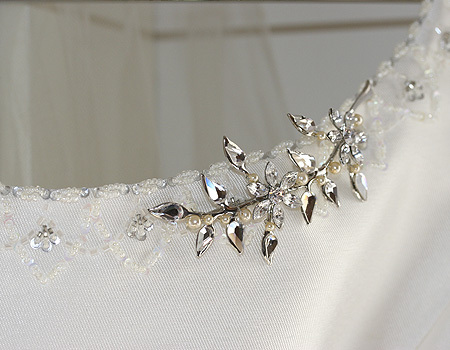 I was on the Knot looking for an example of a wedding gown that beautifully incorporated the use of a brooch when I found found this strapless Vera Wang. Look at the draping of the smooth satin on the bodice and the way it’s pulled together by a brooch (a bow no less)! It’s minimal and modern with a feminine accent courtesy of the perfect, dainty bow. Next I saw this ethereal deep v-neck gown with wispy overlapping layers also by Vera Wang. I love the almost casual way the bow brooch has been pinned on the strap. I believe it’s the same brooch on both dresses used in two different ways. Placement is everything and should always be deliberate and well though out. That’s why I love Vera Wang- the details are always immaculate and thoughtfully placed. On Monday I’ll be back with a showing of our brooches. Have a great weekend!